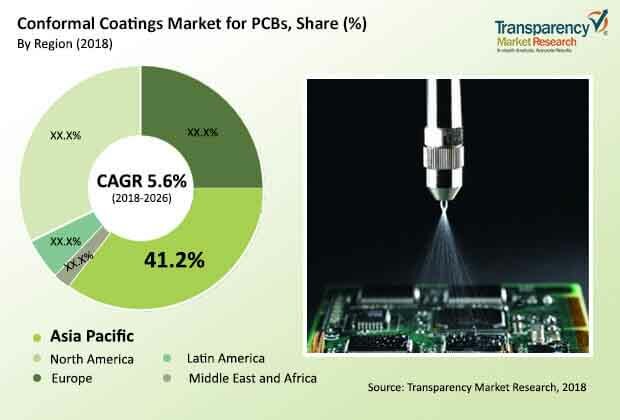 A new report published in Transparency Market Research (TMR) states that the competitive landscape of the global conformal coating market for PCBs demonstrate highly fragmented structure due to large scale and small scale industries operating in this market. The players operating in this market is expected to help in reducing the production cost and to maintain competitive edge in this market. The major players operating in this market are largely focused on product innovation and advancement in technologies in order to enhance the growth of this market. The prominent players are also focused to serve various end user industries in order to gain foothold in the global market. This market is likely to register significant growth during the course of forecast period from 2018 to 2026. The study also includes some of the key players operating in the global market for conformal coating such as Shin-Etsu Chemical Company Limited, Dow Corning and Henkel AG & KGaA. The top three players accounting for excessive growth in the overall market throughout the said period. According to TMR, the global conformal coating market held an opportunity worth at US$ 8,871 Mn in 2017. The market is expected to expand at 5.6% CAGR during the course of forecast period from 2018 to 2026. On the basis of segmentation, the global conformal coating market is divided into parylene, acrylic, epoxy, polyurethane and acrylic. Among the product type, acrylic dominate the global conformal coating market in terms of adoption. Geographically, Asia Pacific dominates the global conformal coating market on account of PCBs with a share of 41.0% in 2017. This market is likely to attain maximum share on account of increasing expansion of the automotive industries and consumer industries, rise in disposable income, rise in population. The expansion of medical industries and automotive industries is another lucrative opportunity boosting the growth in the Asia Pacific region. The use of the conformal coating in the consumer electronic devices for enhancing the durability and reliability of PCBs, which is one of the important factor propelling the growth of the global market for conformal coating of PCBs. The increase usage of the consumer electronic in other end user products such as computer, television, smartphone are some of the key factor influencing growth of the overall market in near future. For each and every consumer electronic appliance, the printed circuit board is core part and the need for protecting from contact of harsh environment is another factor triggering growth. The major development in consumer electronic industry could likely to propel the growth of the conformal coatings market for PCBs across the globe. The usage of high quality PCBs in aerospace industry is another key factor influencing the growth of the global market for conformal coating market for PCBs in coming years. The Delamination in conformal coatings is the elimination of the conformal coating from the surface of printed circuit boards, this can be one of the important factor hampering the growth of this market in near future. Delamination is linked to aspect like cleanliness, degree of coating cure and compatibility. Furthermore, if the surface of the printed circuit board is dirty, delamination of conformal coatings may happen owing to unfortunate adhesion of the coating to the shield.